[Vassilis Papanikolaou] took a good thing and made it better with some design upgrades to this AVR based signal generator. We looked at version 1.0 of this tool back in 2006 and since then it saw an upgrade to 2.0. But [Vassilis] wanted to take things one step further, with a compact single-sided PCB. What you see above is the beautiful result of his work; a professionally made board that is compact, uses through-hole components, and has zero wire jumpers. If you want to build one for yourself there’s a great parts list as well as board artwork and schematic. The system uses an ATmega16 so you’ll need a way to program one. There’s also just a bit of firmware tweaking to remap the control buttons to match the updated hardware layout. I think one of these will be on my bench soon. 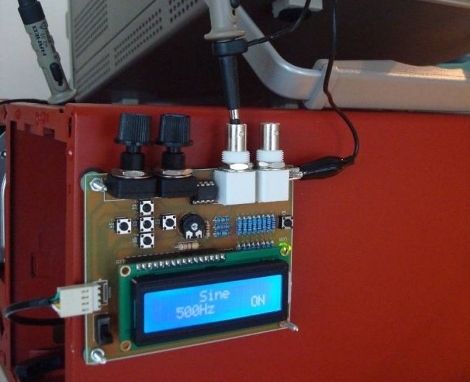 Very cool project… too bad I just bought a function generator a few days ago. Would still be a great project to play with. It would make a great Christmas gift for my brothers, especially with a super probe. I know how hard it is to do single-sided layouts when complexity increases. So for that alone, I award you hacker cred! Thanks for posting ! The PCB is exactly half of the standard 160×100 factory panel. So I have one left to give away :) Anybody interested ? In this particular design, it seems that SMD wouldn’t save much space ! Moreover, it would be more difficult for the average hobbyist to replicate.